It doesn’t matter how small your business is, sales and marketing are vital tools in helping you raise awareness of your brand and attract new clients and customers. Small business owners generally set up their own companies because they want to spend their time doing what they’re passionate about. However, entrepreneurialism also means learning new and different skills to complement your passion and help grow your business. Until you begin to make enough profit, you’ll probably prefer to – or more likely have to – do everything yourself. This will be anything from the administration and accounts, buying the stationery, dealing with incoming and outgoing post, sweeping the floor etc. More importantly, it’s also up to you to raise awareness of your brand, create loyalty, and turn that into sales. Otherwise your business will never move forward. How do you do sales & marketing? Unless your passion is for sales and marketing, you may struggle with the concept. 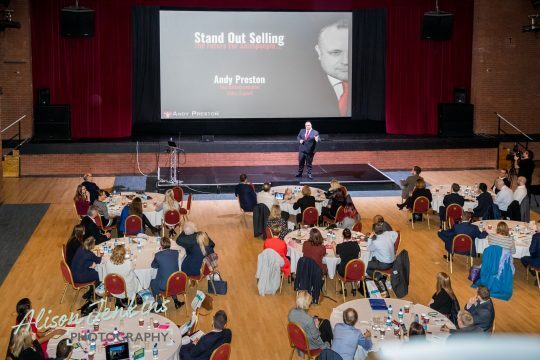 That’s why some of Hertfordshire’s core SMEs have combined forces over the past four years to organise Ambition, a one day sales and marketing conference aimed at helping small business owners improve their bottom line. Their sponsorship and active participation mean that the cost of attendance is only £95 – more than affordable for even the smallest business. What’s more, all the proceeds are divided equally between two local charities. This year those charities are the Muscle Help Foundation, and 15 Years of Rubber Cheese’s £15k challenge in aid of the Tamba Bereavement Support Group. The fact that the conference is so beneficial for entrepreneurs, start-ups and charities attracts some of the top names in the country to speak at the Ambition conferences. This year is no exception, and our speakers include memory world record holder David Thomas, the brains behind Too Fat To Run Julie Creffield, author and marketing expert Bryony Thomas, and one of the top media coaches in the UK Alan Stevens. Moderated by award-winning broadcaster Jeremy Nichols, the speakers will also be joined by local marketing experts Justine Perry of digital marketing agency Cariad Marketing, Kelly Molson of design and development agency Rubber Cheese, and Saija Mahon of Mahon Digital Marketing. In addition to learning loads about sales and marketing from our speakers, you’ll have the opportunity to network with nearly 100 local entrepreneurs, managers and business owners. You’ll also be able to network with and ask advice from MDs and representatives from the sponsor companies. We’re giving away two FREE places in our Ambition prize draw. All you have to do to enter is click here and leave your email address, and you could end up winning your place at Ambition, free of charge. Alternatively, if you don’t want to leave it to chance, click here to book your ticket now.